When to engage with a prospect and what to ask is the key to any sale. Asking for the sale too early in the decision process will seem pushy. 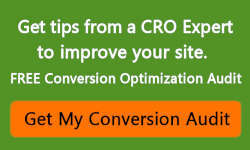 Not asking will reduce conversions to only those who really want your product or service. 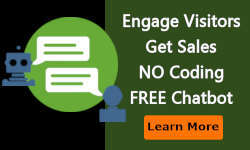 This section will discuss a typical sales process and when to engage with the website visitor. Each product and service has a different sales funnel. Below is a general sales funnel from the user’s perspective. 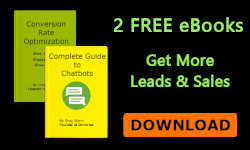 Your sales funnel may have more steps in the process. Each step in the funnel has a different interaction that is triggered by a different user engagement signal from the prospect. 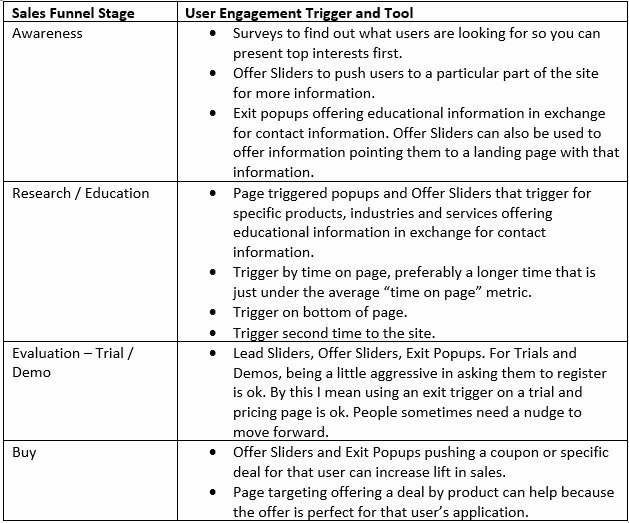 The following pop-up triggers descriptions can also be used for Lead Sliders, Offer Sliders and Surveys. Trial or demo – having a user fill out a form for a trial or demo. It is low risk, and when asked a second time, you can get a lift of 10% or more. Link triggered pop-ups activate whenever a customer clicks a text link or image in the content or sidebar of the page. The advantage of the link or click popup is the user is in control. Studies show that if a user takes an action to open a popup, they are more likely to complete the process. For example, in some cases a form on a landing page has a lower conversion rate than a text or image-linked popup when it shows the same form. Second time to site trigger sets a cookie to trigger when they return to the site within a set time period. This trigger works well to provide a special offer since you know the visitor is interested enough to visit twice. That last bullet is regarding a new Google algorithm change starting January 2017. You can read more about it HERE. The short version is you can no longer use full page pop-ups on mobile if you want your page ranked for mobile searches. Google is trying to improve the user experience by being able to read the page before seeing the pop-up. If you have a landing page with traffic driven by paid advertising or email, you are fine. 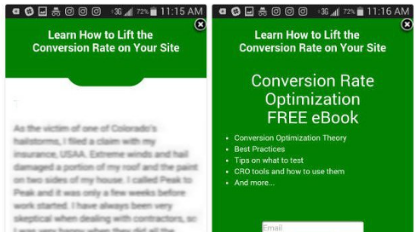 If it is a page that has organic ranking, then use Ometrics mobile Banner Pop-Ups which are Google safe. They allow the user to read the text on mobile and take action to view the whole popup if desired. You can also use a Lead Slider or Offer Slider triggered at the bottom of the page or after they have had time to read the page. Here is an example of an Ometrics interstitial Banner Pop-Up. The banner can be triggered by the user’s action in a number of different ways. When the user taps the banner, it opens up to a full banner. Only shows on a specific page. Sometimes a full screen model type pop up is just too much for the user. In this case, using a Lead Pop-up Slider or Offer Pop-up Slider can be the perfect solution. These are small window sliders that slide from the bottom or sides of a page. They ask a simple question with a form or have a banner type offer. What trigger should I use for each stage of the sales funnel? This is by no means the only way to use a particular trigger for a stage in the sales funnel. Testing different triggers and tracking engagement quality and conversion for your industry is the best practice.